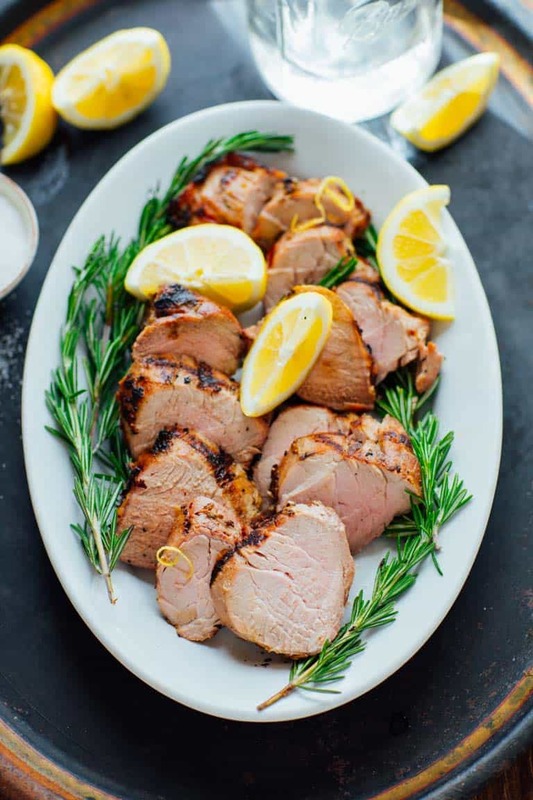 This Easy Grilled Lemon Garlic Pork Tenderloin recipe with rosemary is super simple, but full of flavor. It will be one you return to over and over again this spring and summer! It’s naturally gluten-free, paleo, whole-30 and low carb. Remember how I was just telling you I had been dreaming of surprising the kids with a trip to Disney? Well, guess what I am doing tomorrow morning? The girls and I will be heading outta here on a jet plane to Orlando. I feel like that kid in the Disney TV commercial who falls over with the sillies saying “We’re too excited to sleep!” That’s me! 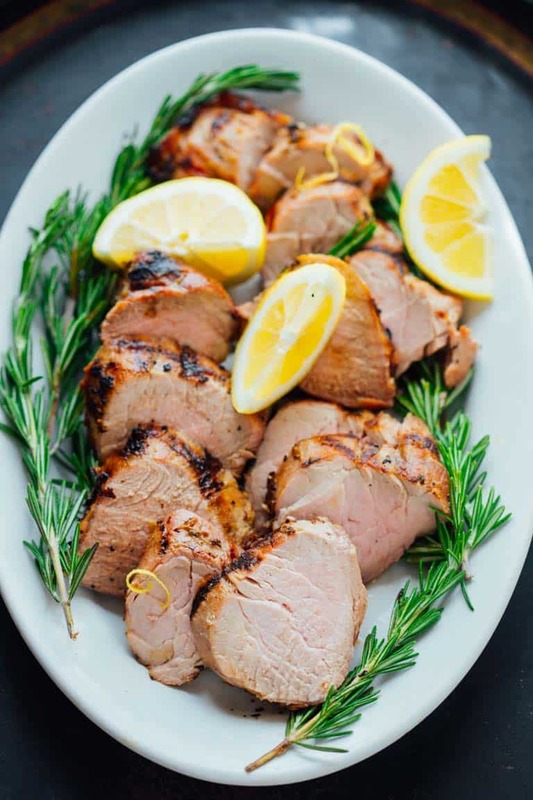 Before I go, I am so excited to share this Easy Lemon Garlic Pork Tenderloin recipe with you. I made a special trip to our natural grocery store to buy sustainably raised pork. You can read more about why I do that here in this recipe for 15-minute ginger pork. 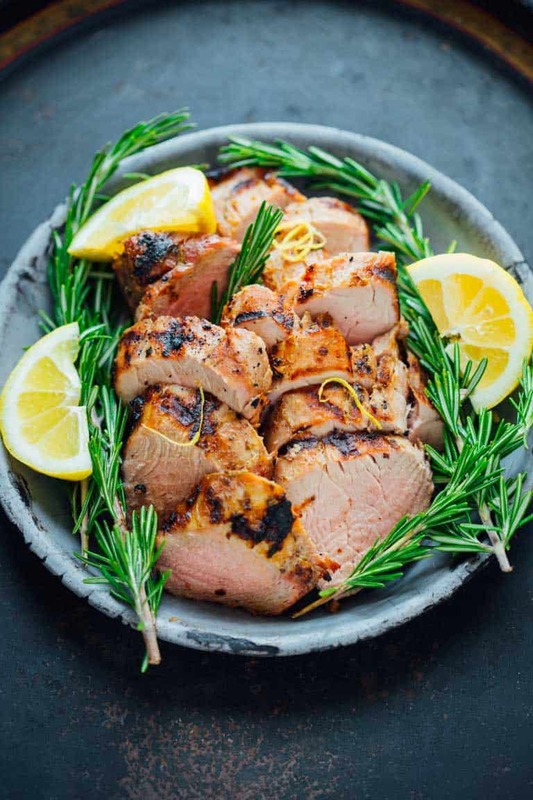 Not only is the animal husbandry a consideration for this recipe, but also conventional pork tenderloin has sodium solution added to it, and I try to avoid that. I took two cloves of garlic and grated them with my micro-plane zester. Then I zested a lemon. I mixed the garlic and lemon together with a little chopped rosemary, salt, pepper and olive oil. It formed a paste of sorts which I coated the pork with. I only used 1 teaspoon of lemon zest. Any more than that makes the pork taste like lemon Pledge. 1 teaspoon however, is bright and lovely and pairs well with the rosemary. If you plan ahead, refrigerate the pork all slathered in the paste for four hours. That will really impart a ton of flavor. But I also tested it with only an hour of marinating, and that was also totally fine. To grill the pork tenderloin, I preheated the grill, and brushed it down well. Then I oiled it and on went the pork. I turned it every three or four minutes, and then checked the internal temperature with my insta-read thermometer. Make sure to insert the probe into several places to get an accurate reading. I know the official temp for pork is 145 then a rest. But when I tried that, it was really overcooked. These natural pork tenderloins are only 1 pound- and by the time the center is up to 145 it’s hot all the way through basically, and the carryover takes it way beyond where it needs to be. So I found pulling it at 138 was much better. As you can see in the pics, there is only a faint amount of pink. If you are at all concerned about the safety of the internal temp, I say do what YOU think is best. Let the pork rest for 5 to 10 minutes before slicing. This allows the proteins to relax, and will ensure that all the juices don’t flow out when you slice it. Have you ever been to Disney World? Do you ever make a special trip to source an ingredient? What are you grilling these days? Combine garlic, oil, zest, rosemary, salt and pepper in a shallow baking dish. Add pork, turn to coat in the marinade, cover and refrigerate 1 to 4 hours. Preheat grill to medium-high heat. Soak a paper towel with oil and set near grill with tongs. Let pork rest on a carving board tented with foil, at least 5 minutes. Slice cross-wise into ½-inch slices and serve. This is a perfect substitution for a traditional Sunday roast – looks amazingly delicious. I’m so glad you think so Sylvia. Thank you very much. I don’t eat pork but can imagine this flavour profile working well with so many other meats! now that is one tender looking meat. My family would love this .. its looks awesome! 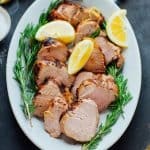 Isn’t pork tenderloin so good! Glad you think it looks yummy Claudia. Have a great day. That’s such a good tip about pulling it out a bit before it reaches it’s final temperature! 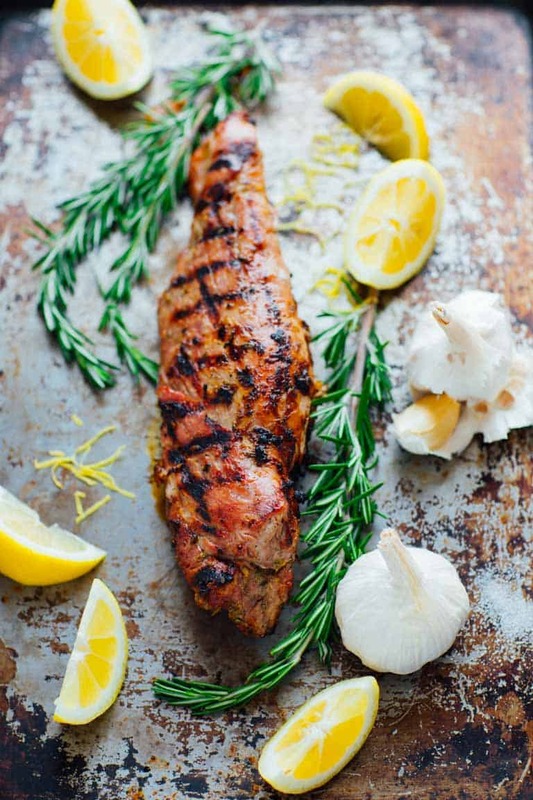 Such a gorgeous dinner and the lemon and rosemary flavors are classic! Glad you find that useful too Pam. Thanks so much for coming by today. Have a great weekend. This looks so good! 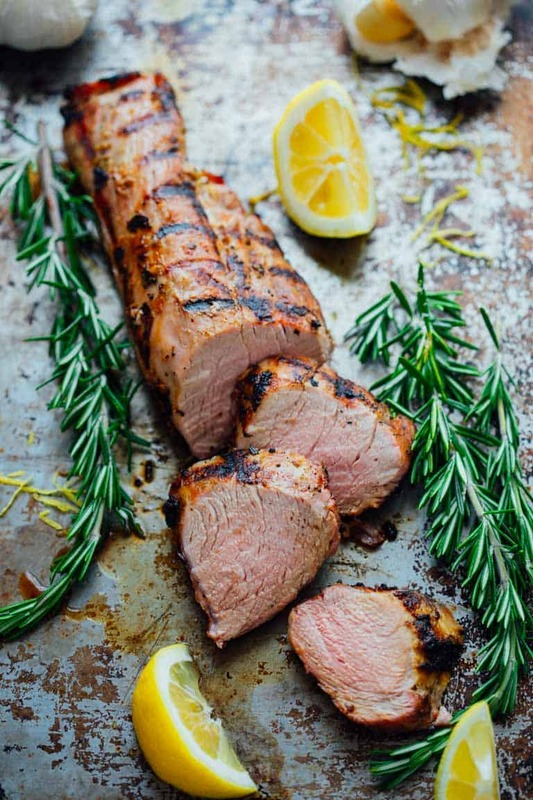 We love pork tenderloin so this is perfect for us! Your photos are gorgeous! That’s great to hear Stephanie. Thank you so much! Have a great weekend! We raised hogs on my parents farm for years. 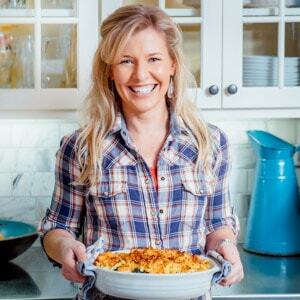 Love this pork recipe and happy trip to Disney! Your pics are beautiful! That’s very cool. I am sure the pork was so much better than the run-of-the-mill kind you can find in most grocery stores. Thank you Jessica! Looks yummy! 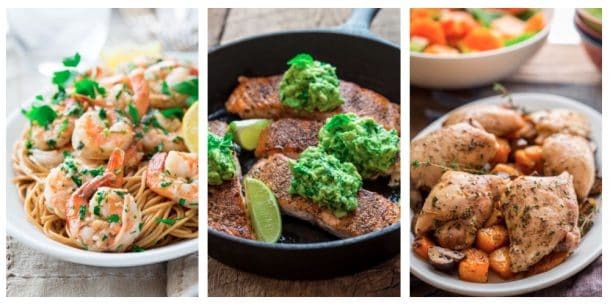 Will be adding this to my Whole30 dinner rotation for sure! That’s great to hear Lisa! Enjoy! Can this be done without using a grill. Yes! Use a large cast iron skillet or heavy stainless skillet. Preheat the oven to 450 degrees. Sear the pork on the stovetop over high heat. Ise 2 teaspoons oil in the pan and cook until browned on all sides. Then transfer to the pork in the skillet to the oven to finish cooking through. Check for the internal temperature as directed. I made this a couple weeks ago- SO good! I made smashed potatoes with it- the whole meal was a hit. Will definitely make it again! I am so glad you liked it! Thank you for coming back to let me know how it went. I really appreciate it.